I finished quilting Meaghan’s quilt last night. Meaghan herself sewed the top, picking out all the fabrics, choosing the placements, figuring out the borders. All I did was quilt it, really. I quilt as a break from staring at a computer screen, and Ron has other hobbies he does for his mental break. For both of us, it’s a different part of the brain working, and more involvement with our hands. And I am not alone. But, as I’ve been sewing and quilting lately, I’ve been thinking of the similarities between quilting, specifically, and Open Source. A main principle and practice of open source software development is peer production by bartering and collaboration, with the end-product (and source-material) available at no cost to the public. In our day-to-day work life, Ron and I do exactly this. We work on a piece of software, both front-end and back, and share information and code mostly freely between ourselves and others. In this way, the entire codebase gets better and it eventually benefits everyone using the software, not just ourselves. In the early days of quilting, women would come together to work on quilts, share patterns, and learn from one another. Well, not just the early days – even now we do it. Take this example, while pretty simple and silly: One of the default plugins in WordPress is called Hello Dolly. When activated, it puts one line of the song “Hello Dolly” in the top right of the admin area. On a page refresh, a new line is shown randomly. If you look at the code (and you can, easily) you can see what it does. I took a copy of this plugin, modified to my heart’s content, and instead of it showing what it did, I made a version that gives advice from Chuck Norris. 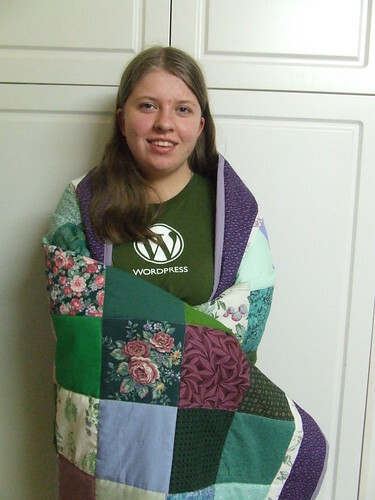 Yeah okay, you see my point here with the code, but what about the quilt? Take a very traditional, very old quilt pattern called 9 patch. It has nine squares, hence the name. Usually, you alternate light and dark squares. Over the years, quilters using the design have experimented both with fabrics, color placement and finally cutting to come up with a more modern favorite called Disappearing nine patch. But it starts with the exact same block. And in both cases, prolific blog posts explaining how to do it, and a pattern (plugin) at the end, freely distributed. If I said quilting bee, you’d thing of Ye Olden days, but they still happen, and loads of people (yes, mostly women, but an increasing number of men) show up for quilt-related trade shows, displays, galleries and classes. There’s lots of gorgeous quilts to look at products to buy and new things to learn. WordPress? Oh yeah, they have these things called WordCamps all over the place, sponsored & organized locally, where fans/users/devs of the software get together and look at cool new sites, explain new features, and show off some how to’s. Oh, and there’s usually swag. Some nights, I am here at the monitor, a faint glow in front of me, my hands on the keyboard. Occasionally, I use the mouse, clicking here and there, dragging and dropping files. Typing in lines of code, writing words of documentation. The whir of a fan in the background. Last night, I was at the machine, a forty year old Brother I bought at a yard sale for $5. The light bulb needs replacing, but the light overhead and through the window was enough to finish. My hands guided the fabric, shifting and moving, stopping where needed to run and adjust the pile of fabric. The foot pedal starts and stops. Not to belabor my point here, but a quilt is made of of dozens, if not hundreds or even thousands of pieces of fabrics, stitched together to make a whole, chosen carefully based on color and pattern. Then this top is layered with batting and a backing and firmly quilted, the edges bound for wear, maybe a pocket on back for display, before it is set out for use. This site is made up of thousands of lines of code, carefully selected plugins enabled, a theme & color scheme selected. Each post adds to the overall effect, and the layers of frontend – backend – webserver – internet all flow seamlessly to display my words how I want on your screen. They can both take a lot of time, or they can both be whipped up in a hurry, using preselected fabric/themes, each a different patchwork of art based on the user/creator. They really aren’t all that different. Actually, a couple friends of mine were twittering back and forth about how awesome it was, so peer pressure snuck in and yeah, I tried it. I did have to sign up for an opt-in newsletter, than wait for the staged video links to come in to my inbox within a short enough time for me to still remember I was actually interested, and THEN had to find the right links to click in the needs-a-redo-for-usability newletters to get redirected to a page with the *actual* video on it, when I remember to scroll way down the page enough. The office is where I read my mail. I’ve been playing the videos on my desktop and trying to follow along. This is not a big room, and it has office chairs in it. Sometimes, another person is in the other chair. While there is a nice patch of floor, it is not in a good viewing spot of the screen. I am already about a week behind from when I signed up, sporadically fitting it in when I can remember. So, there I am on the floor. One eye is trying to follow the screen, I can barely hear the instructor’s insanely chipper and perky voice, my palms flat, my legs extended in two directions and I am using unknown muscles to try and stay upright. The perky voice tells me to clear my mind and breathe. I’m still trying to find my elbow with my knee while she’s instructing me to the next step, which involves balancing my weight on my wrists. So for the past couple of days, I put it up earlier on my schedule, before anyone else is up. Downstairs, with a bigger floor in front of the tv, through the Wii & the Internet channel. Silence, save for the stove kicking on and off, the birds chirping outside. And a nice comfy couch to watch it from. Wow, I turned forty & fabulous. Among other things, I got 40 fat quarters from my mom, $40 from my aunt (with instructions to make sure I spent it on ME) and about 40 birthday wishes on twitter. And, you know, my husband sneaking in my blog on me. Today we went to visit Mam & Carl.It was a long day (& drive) but a great visit.Tomorrow is Andrea’s 40th birthday. So, the trip was part of Andrea’s birthday celebrations.